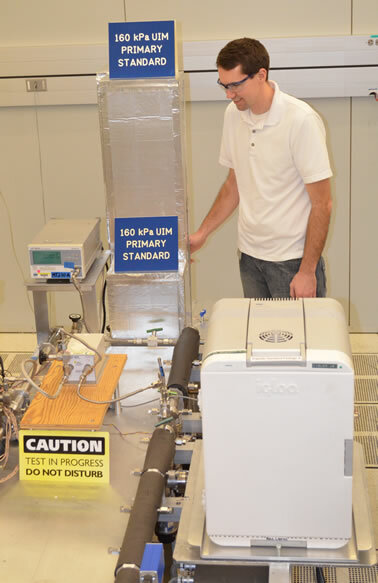 NIST has developed best-in-the-world primary standard pressure measurement capabilities for pressures spanning the range of 0.01 Pa to 360 kPa through the operation of four liquid-column manometers. While the principle behind the primary standard is simple, the manometers are operationally complex, requiring accurate determination of temperature, density, gravity, speed of sound, and ultimately column height. The NIST-designed manometers are unique in that they use an ultrasonic interferometric technique that enables operational column height resolution of 10 nm to 20 nm. Custom electronics and software implement a pulse-echo technique that uses the change in phase between sent and received radio-frequency acoustic signals to determine the length of a mercury or oil column. A diffraction correction model further refines the technique. 360 kPa Mercury Manometer. The 360 kPa Ultrasonic Interferometer Manometer is three meters tall and provides the nation with best-in-the-world capabilities for measuring absolute and differential pressure from 1 Pa to 360 kPa with an expanded uncertainty (k=2) of [(6 x 10 - 3 Pa)2 + (5.2 x 10-6 * P)2]1/2, where P is the pressure being measured. It is primarily operated for calibration of piston gauges (absolute or differential) between the pressures of 10 kPa and 360 kPa. 160 kPa Mercury Manometer. The 160 kPa Ultrasonic Interferometer Manometer, or 1 meter manometer, provides the nation with best-in-the-world capabilities for measuring absolute and differential pressure from 1 Pa to 160 kPa with an expanded uncertainty (k=2) of [(6 x 10 - 3 Pa)2 + (5.2 x 10-6 * P)2]1/2, where P is the pressure being measured. It is primarily operated for calibration of capacitance diaphragm gauges, resonance silicon gauges, or quartz Bourdon gauges between the pressures of 1 Pa and 360 kPa. 140 Pa Oil Manometer. The 140 Pa Ultrasonic Interferometer Manometer is the only manometer at NIST that it uses oil instead of mercury as the working fluid. Oil provides for a lower vapor pressure and lower density, enabling measurements to pressures as low as 10-2 Pa. This manometer provides measurements of absolute and differential pressure from 3 Pa to 140 Pa with an expanded uncertainty (k=2) of [(3x10-3 Pa)2 + (36 x 10 - 6 * P)2]1/2 and from 0.01 Pa to 3 Pa of [(7 x 10-4 Pa)2 + (1 x 10 - 3 * P)2]1/2, where P is the pressure being measured. It is primarily operated for calibration of capacitance diaphragm gauges between the pressures of 0.01 Pa and 140 Pa.
Calibrations are performed in batches. Contact staff member for scheduling.